One-time Eurovision winner Dana will be treated to a re-run of her winning song by a choir of Padiham schoolchildren. 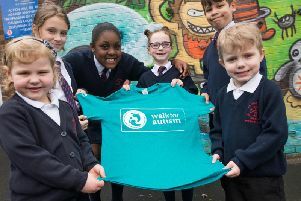 The choir from St Leonard's CE Primary School will serenade the Irish former singer and politician with a re-written version of her hit 'All Kinds of Everything' when she opens the Christian Resources Exhibition in Event City, Manchester. The 40 or so children have been practising for some time to conquer the unusual words describing items to be on show at CRE. "They are thoroughly enjoying it and seem to be able to cope with the more awkward words," said the school music co-ordinator Suzanna Halsey. "The children seem to relish the challenge of the new song and are looking forward to the occasion. It is good to have the opportunity to perform in public, particularly as Dana will be there listening. "We hope that she likes the version we are singing and that it brings back happy memories of her Eurovision win in 1970 when she herself was still a schoolgirl." The exhibition in Manchester has been welcomed by the Archbishop of York, Dr John Sentamu. He said: "CRE is an event that brings together churches from many different traditions and persuasions,’ he said. ‘It is an ideal place for positive discussion and agenda setting. My prayer is that we all find wisdom, courage, integrity and compassion for our political leaders and MPs, for reconciliation and a fresh and uniting vision for everyone."